On July 9, 2002, the Museum took its first big step toward finding a new and permament home. SMVRHM made a preliminary presentation to the Santa Maria Recreation and Parks Commission proposing to occupy some combination of the buildings at 626 S. McClelland that the Rec and Parks Department is in the process of leaving. The property anchors one end of what is fast becoming a cultural center of the City, and provides the potential of easy access to the rails of the downtown railroad yard that the property adjoins. 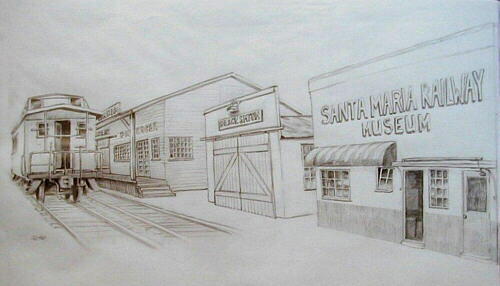 Pictured at right is an artist's rendering of how the renovation for the SMVRHM at that location might appear. The proposal was well received by the Commission who directed that the Recreation and Parks staff continue discussions with the SMVRHM about this project. Pictured at left are the Recreation and Parks buildings at 626 S. McClelland as they stand today (July 2002). A copy of the presentation made to the Recs and Parks Commission is available here: 626presentation.pdf [PDF, 1.0mb]. You'll need the Adobe Acrobat Reader for PDF files. It's free.